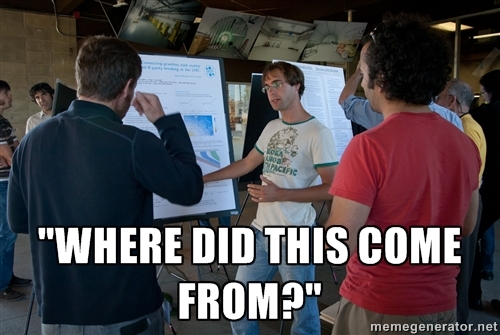 "A History of the Poster Session"
Today, academic poster sessions can be found in just about every institution in the world of higher education. What started out as a practice of the natural sciences have evolved to encompassed just about all fields of studies, from the humanities to the social sciences. Its origins, however, seem obscure. Poster sessions first surfaced in the late 1960s, in the form of graphics, diagrams, and pictures. Without the presence of text, the posters were meant to help the researcher communicate the contents of his research through a tangible "card". But text soon enter the game, and the term "poster session" was already in use by 1970. 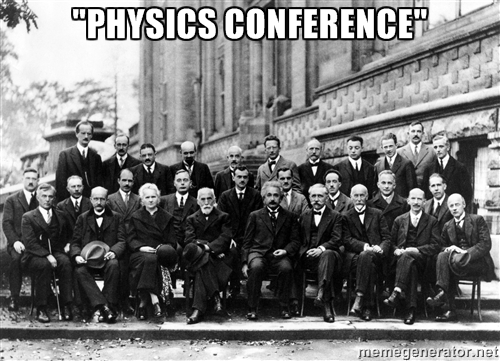 The poster session was introduced to the American Physics Conference of 1975, much to the joy of physicists and researchers. Surveys at the time convey very positive responses among the scientists. Since then, the spread of this format of information dissemination in academia have become almost ubiquitous. As scientists have appropriated this mode of communication before for their intellectual needs, I plan to propose a series of alternative modes of dissemination that takes advantage of the information economy of the 21st century. Dr. Francoise Waquet recently wrote about the impact of reading while standing on the rise of the poster, he explores the consequences which the recent emergence of digital posters can have on the content of the posters themselves and the organizational platform of the poster sessions in his "Lire debout. Le poster comme pratique de lecture dans le monde scientifique" (March 2012). Discussion of "'A History of the Poster Session'"
Version 8 id 284328 of this page, updated 21 December 2014 by Jerry Yu Qin. Created by Jerry Yu Qin. Information Dissemination in Academia by Jerry Yu Qin. Help reading this project. Published by Published by Jerry Yu Qin . Powered by Scalar.